The new Reference 600 - the Reference 600+ is a high-performance potentiostat/galvanostat/ZRA particularly suitable for applications in physical electrochemistry, sensors, coatings, and corrosion. The Reference 600+ is a high-performance, research-grade potentiostat/galvanostat/ZRA designed for fast, low-current measurements. It does well for a variety of applications such as physical electrochemistry (especially at microelectrodes), fast cyclic voltammetry, electrochemical corrosion, electrochemical noise measurements, paints and coatings, and sensors. It has a number of auxiliary input and outputs designed to help you interface or control ancillary equipment such as a rotating disc electrode. It also has a thermocouple input for temperature measurements. The Reference 600+ comes fully equipped to perform electrochemical impedance spectroscopy. 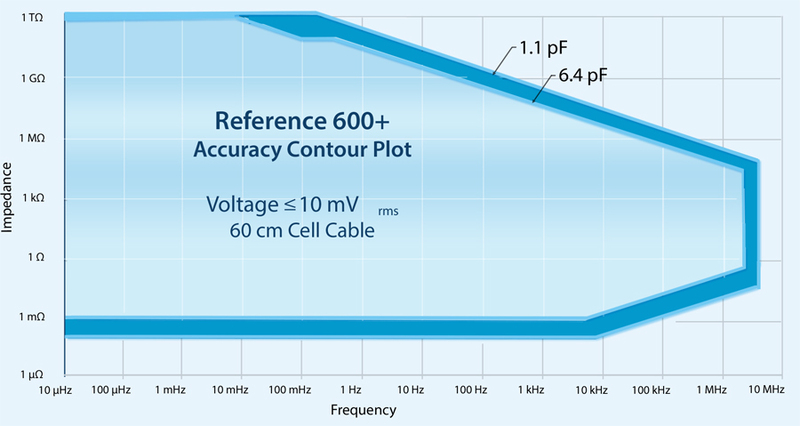 The Accuracy Contour Plot shown below provides a detailed look at the performance you can expect from your instrument in real-world situations. The results include the cell cable. Below are additional details regarding the capabilities of the Reference 600+ potentiostat. Each bullet point contains a list of the type of techniques available for the instrument to run. eChemDC Toolkit - contains all of the capabilities of the eChemBasic and further extends these capabilities by adding advanced signals and data acquisition modes to simplify implementing experiments like cyclic voltammetry, pulse voltammetry, and dynamic DC corrosion techniques. Also includes more advanced stop tests, particularly useful in fast experiments. 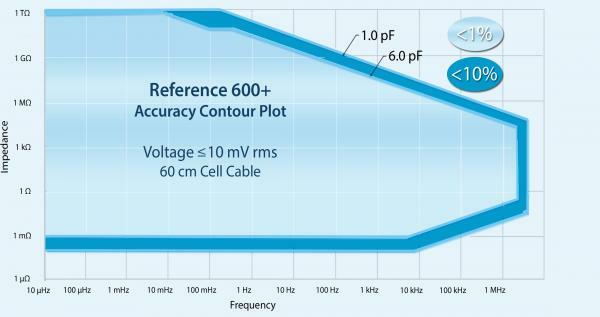 On-board DDS to perform EIS from 10 µHz to 5 MHz. "Excellent equipment. Reliable results. Excellent technical support especially from Dan. It's used everyday." "Gamry potentiostat is a very useful tool we use in the lab. They have a nice technical support team. Good value for money. Very versatile"
Organization: A Plus Coating Solutions Inc.
"The instrument is easy to use. I used the instrument to determine the impedance of the applied coating sample. The instrument is stable and the result is reliable." Reference 600+. Definitely worth the investment in terms of cost. "In terms of performance, this instrument has produced reproducible and accurate results. The potentiostat and software are easy to use (I've trained 30 freshmen to work independently on this device for a CURE. CV, CA, and EIS). We've had good luck with all aspects of the instrument's constant use for the past year. Definitely worth the investment in terms of cost." "I characterized conducting polymer by impedance spectroscopy. I am using Gamry Reference 600 potentiostat. I am so satisfied with the results." "The software and instruction was easy to follow and straight forward to understand. However, Gamry could have provided more tutorial and background knowledge of each of the functions of the machine"
The 600+ is well but there was a small bug! "There a small bug on your software "Gamry Echem Analyst", which I have reported to your sales staff. However, this problem has always existed. I hope it will be solved as soon as possible. In general, the 600+ works very well. Thanks!" "The instrument gives us what we need--reliable results in a small package. Our instrument is for R&D, so its versatility is crucial. I would like to see other (read: smaller) types of contacts for grabbing and holding very small samples (hence the 4/5 for ease of use) but otherwise, we are happy with the instrument." Application Area: Analyze electrochemical properties of porous carbon materials, we usually test CV, CD, EIS and etc. "We usually use the machine for testing CV , charging-discharging, or EIS properties of our porous carbon material. It works very well on these tests. the results are reproducible, easy operating, data is good. Also, the service is also good. On many aspects, I like this work station. Two things could be further improved: 1, the fan is noising; 2, the plastic adapters could be firmed." "The Gamry Potentiostats we use are very versatile and user friendly instruments. They give accurate results particularly in the low current range applications." Amazing piece of hardware, capable to produce reliable and very precise results! "The reference 600+ is an amazing piece of hardware and can produce very reproducible and precise results, if in the hands of an experienced user. Support via website and personal costumer care are very good. Despite its price, it is great value for money." Excellent instrument, includes unparalleled customer service and technical support. Application Area: Electrochemical characterization of materials and energy systems. "The instrument works as specified, performing a wide variety of electrochemical storage and corrosion tests to characterize the critical features and parameters that describe utility in electrochemical applications. In addition, the instrument is backed by the strength of the service team, providing technical support and customer service above-and-beyond any standard!" This equipment gave insights I couldn't get via coupon testing. I use it daily! "Historically we only leveraged coupon testing. I came in contact with the Gamry equipment after a Penn State corrosion short course. I leveraged a nearby corrosion lab to generate some results and concluded a few months later this equipment definitely has the right capability for my needs, of fast and predictive corrosion understanding. The order and set up in our lab went really smoothly and happened in partnership with the vendor over 3 days of training. Following the training the supplier offered a question and answer period of two weeks to ensure all went fine, and I submitted a few questions and received great help. Given the great partnership with the vendor the implementation, ease of use and after sales support turned out to be most successful. I wish I had bought and implemented it earlier." "Reference 600+ is easy to use and highly reliable. Also it looks a lot better than the old 600 series."